I think I’m the only person in the world who did not get the hype for HBO’s True Detective. I tried to watch the first season but it never clicked. It had amazing acting, but I found the pacing made it a slog to get through and most importantly its story telling gimmick of multiple time jumps confusing and simply broke the narrative flow. Those same issues have returned for Season 3. If you’re looking for a taste of the final season of Game of Thrones, the second season of Big Little Lies or the third season of True Detective – or even season two of Barry – check out the new teaser trailer from HBO below. Conspiratorial Trailer: True Detective Season 2! The first teaser for season two of HBO’s True Detective has dropped and it looks like it will be just as dark as season one. 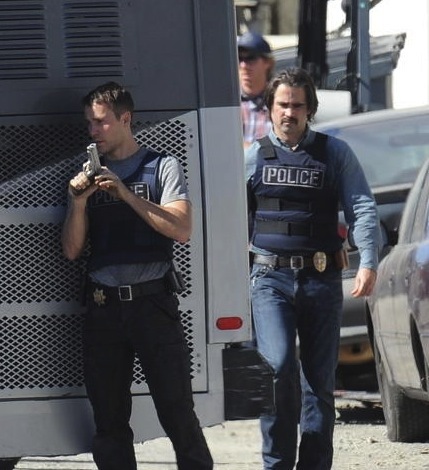 Season two finds three police officers (Colin Farrell, Taylor Kitsch and Rachel McAdams) and a career criminal (Vince Vaughn) attempting to break through a web of conspiracy following a murder. Check out the teaser after the jump. True Detective, Season Two, premieres on HBO on Sunday, June 21st. DGA Awards Nominations for TV and Documentary films Announced! The last of the Directors Guild of America’s DGA Awards nominations were unveiled today. Once again, network television was shut out. Homeland directors were nominated for two episodes, Game of Thrones one and House of Cards one. The complete list of nominees follows the jump. The 2014 Emmys: Improved Presentation, Same Old Confusion! If there’s anything more confusing than a list of Emmy® winners, I’m not sure I know what it is. Even after some horrendous snubs (not just Tatiana Maslany…), there were still a lot of worthy nominees this year. The problem is that deserved wins by the consistently excellent Breaking Bad (for example) were cheapened by repeat wins by shows that were not as good as other nominees in their class (Modern Family, for example). For every win for something new and amazing (Fargo), there was a win that made no sense at all (Kathy Bates over Allison Tolman? WTF?). And how does Louis C.K. win for comedy writing and lose comedy series to Modern Family, Academy? You just said that Louie had the best (ie: funniest) comedy writing! Anyway, follow the jump for a complete list of Emmy winners and, quite possibly, a wee bit of commentary. 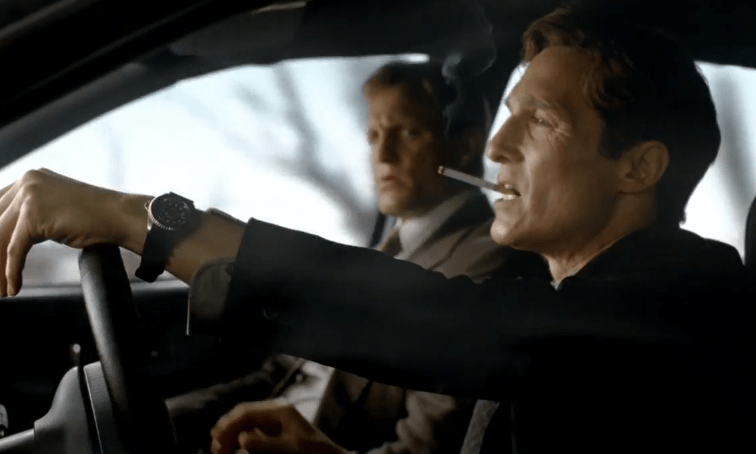 True Detective – After You’ve Gone: Ramping Up The Tension! The tag for night’s episode of True Detective (HBO, Sundays, 9/8C) – Hart and Cohle forge a truce to probe a murky string of disappearances that tie to the symbology of the Dora Lange murder and the Tuttle family – is accurate, but definitely an understatement. 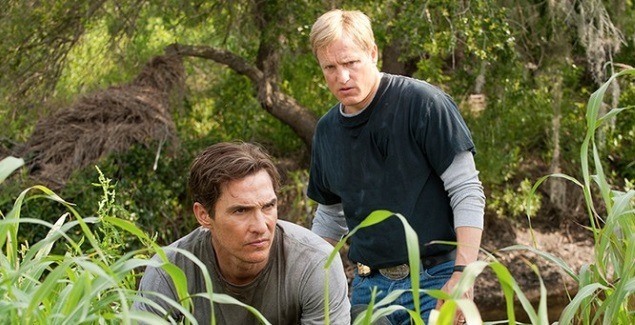 True Detective: Things Are Coming Apart As They Come Together! Can you betray someone by not doing something? Is Rust aware he’s part of a story? True Detective (HBO, Sundays, 9/8C) became much more than just another murder mystery right from its premiere. The series has called into question various philosophies; the nature of the universe; the concept of fate, and whether a person’s character can change. In tonight’s episode, Haunted Houses, things simultaneously begin to come together and fall apart. Read a review of Haunted Houses and check out a sneak peek of a key moment (warning: F-Bomb alert) after the jump. True Detective Sets the Bar High for 2014! 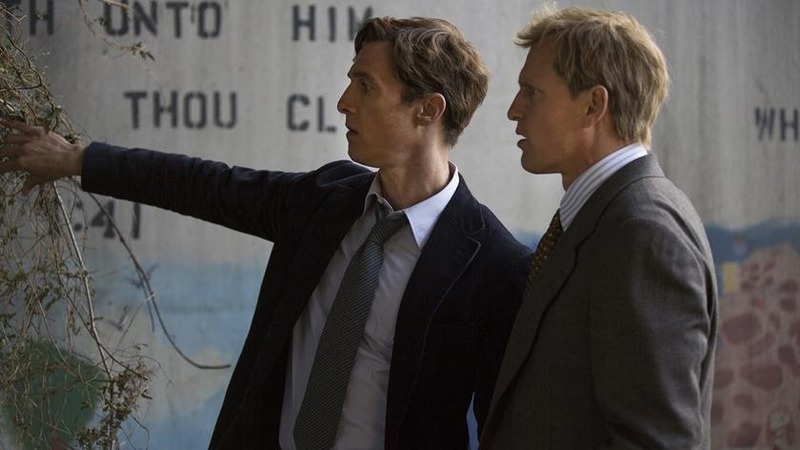 HBO’s True Detective (Sundays, 10/9C) is something of an anomaly in American television – every episode was written by series creator Nic Pizzalotto and every episode was directed by the same director, Cary Fukanaga. It’s a unique vision that features some of the best work by its leads – Woody Harrelson and Matthew McConaughey. Which is saying one heckuva lot. My review includes a teaser for tonight’s episode, The Locked Room – check it out after the jump. 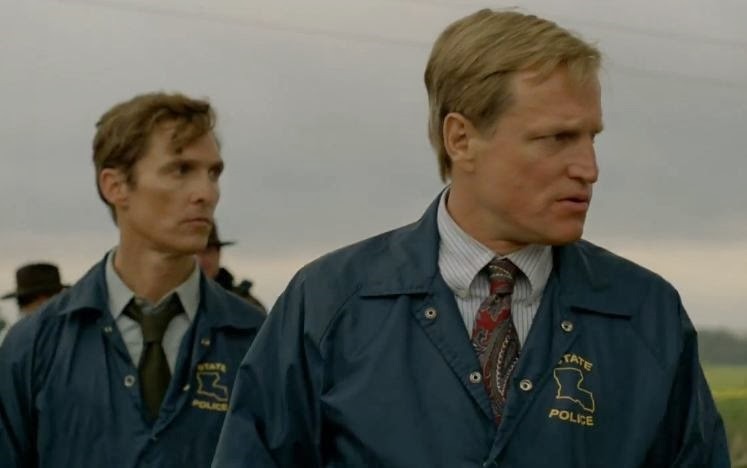 Videos: True Detective Goes Deep Inside Its Characters! True Detective is rapidly becoming one of my favorite new shows. As the above clip shows, it is setting the bar when it comes to being creepy/disturbing without the need for any supernatural elements – just working within the development of character and events surrounding a particularly strange murder investigation (or maybe the strange investigation of a particular murder…). Follow the jump for an inside look at the show’s second episode, Seeing Things. Teaser: True Detective 1.02–Family Man! True Detective (HBO, Sundays, 10/9C) has turned out to be a deeply creepy series about two detectives working a horrifying murder in 1995 and having their brains picked about a similar murder seventeen years later. It features some of the best work in the careers of Woody Harrelson and Matthew McConaughey. Follow the jump to see a brief teaser clip from the show’s second episode, Family Man. If you saw last night’s premiere of the stunning, creepy True Detective (HBO, Sundays, 10/9C), relive one of the episode’s creepiest, most haunting moments, after the jump (language warning: may be NSFW). If not, ‘ware spoilers! And check out an encore presentation of the premiere on Wednesday (10/9C). Plus, look for new, exclusive content at http://www.darknessbecomesyou.com/ as each new episode unfolds.